Audi, Bmw, Citroen, Ford, GM, Jaguar, Mercedes, Peugeot, Seat, Skoda, Volkswagen, and many other vehicles. 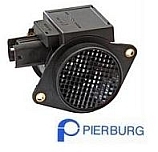 ﻿You can identify if your mass air flow meter is made by Pierburg by the number on the outside of the housing. If you see PBT GF30 on the housing then the number you need will be on the opposite side to this.